The Canary Islands are a Spanish group of islands in the Atlantic Ocean, just off Morocco in North Western Africa. The islands were formed by volcanic eruptions and consist of 7 main islands which are in order of their size (biggest island to smallest): Tenerife, Fuerteventura, Gran Canaria, Lanzarote, La Palma, La Gomera and El Hierro. These islands have long been renowned for their hospitality, beautiful beaches and picturesque villages the panoramic views and unique landscapes are just a few things that have drawn visitors to the islands. Today, the Canary Islands attract sun seekers, from all over the world and are one of the more popular Winter Sun destinations for tourists due to the islands fantastic all year round sunshine. If you are flying into any of the Canary Islands and are wondering which airport you will need to fly to, then hopefully the following will help. The island of Gran Canaria, is serviced by Gran Canaria Airport (LPA), which is often referred to as Gando Airport or Aeropuerto de Gran Canaria. The airport in Gran Canaria is located on the Eastern part of the island approximately 19 klms (12 miles) from Las Palmas. Fuerteventura Airport, also known as El Matorral Airport, services the popular island of Fuerteventura. Located approximately 5 km ( 3 miles) southwest of the capital city Puerto del Rosario, the airport provides easy access to the many popular tourist resorts on the island. There are two airports that serve the island of Tenerife and they are Tenerife South Airport (TFS) also known as Reina Sofia Airport or Aeropuerto de Tenerife Sur. The other airport in Tenerife is Tenerife North (TFN). Tenerife South Airport, is the main airport for tourists and resorts such as Los Cristianos, Playa de las Americas and Las Galletas Los Gigantes. Lanzarote Airport (ACE), also referred to as Arrecife Airport serves the island of Lanzarote. Located approximately 5 klms (3 miles) SouthWest of Arrecife, the airport provide the perfect gateway to many of the islands main tourist resorts. La Palma Airport (SPC) is located 8 klms (5.0 miles) South of the city of Santa Cruz de La Palma. El Hierro Airport (VDE) is located approximately 9 km (5.5 miles) Northeast of Valverde. Over 160 miles of coastline, 150 beaches and an all year round sunny climate, the island of Fuerteventura is a perfect place for a holiday whatever time of year. 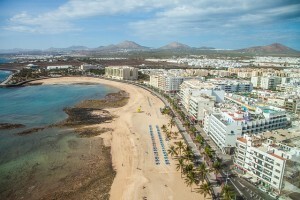 Corralejo, once a small fishing village, is now one of the island’s largest and most popular tourist resort towns. Corralejo Dunes National Park, is a popular attraction with visitors and stretches out for miles. Sotavento de Jandia is located on the Southern end of Fuerteventura and its beach is famous for its crystal clear turquoise waters and golden sands. Ajuy Beach to the West on the other hand is famous for its black sands. 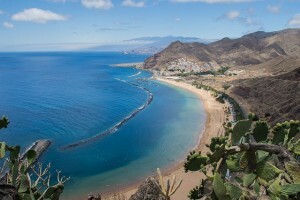 Located just west of Fuerteventura is Gran Canaria a place of ever changing climates and vistas. The landscapes of Gran Canaria have inspired visitors throughout the years of all ages and still today attract a large number of tourists throughout the year. Las Palmas de Gran Canaria is the capital and a port town with plenty to see and do. No matter which part of the island you visit, you can find great beaches and Caleta de Arriba is famous for its surfing. Tenerife, is the largest and busiest of the Canary Islands, receiving around 5 million visitors a year. Tenerife’s beaches come in many shades, from the golden sands of Las Americas Beach and Los Cristianos, to the black sands of Jardín Beach. For water adventures of a different kind, head to the Siam Water Park. Hit the water slides or just relax in the lush environment of this enormous Thai-themed park. Or, make a splash at Loro Parque which has attracted more than 40 million visitors since opening in 1972. The island’s capital Santa Cruz de Tenerife is home to the Auditorio de Tenerife Adán Martin. The auditorium’s sail-like silhouette, harks back to days when the islands were an important stopover for early adventurers such as Magellan and Christopher Columbus. Experience the archipelago’s mythic past at Icod de los Vines. Stand before the “Drago Milenario” a Dragon Tree, reputed to be more than 1000 years old. At Teide National Park, watch the sun set over El Teide, Spain’s highest mountain. It is easy to believe, as the island’s indigenous people did, that this magnificent mountain actually touches the sky. Lanzarote is the Canaries’ easternmost island and is sometimes called the “Island of 100 Volcanoes. ”Be humbled by Mother Nature’s destructive power on a tour of Timanfaya National Park. This region suffered a series of devastating eruptions in the 1700’s and has remained largely unchanged ever since. Standing guard at the park’s entryway is El Diablo, the Devil, an image designed by Lanzarote’s most famous son, César Manrique. Manrique’s artistic vision was to seamlessly integrate art, local traditions and the natural elements and almost everywhere you go on this island you’ll see his influence. Descend a spiral stone staircase into Jameos del Agua, a natural cave transformed by Manriqueinto a magical amphitheatre and performance space. Just a short journey away you can hire a guide and venture even deeper into the earth at the Cueva de los Verdes, the green caves. 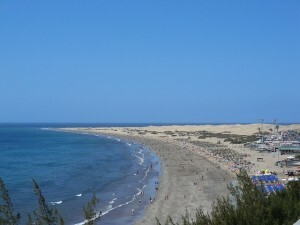 Just like the other Canaries, Lanzarote is blessed with many different beaches. Relax under the sun at Playa Blanca at the south of the island or stroll to Papagayo Beach. The tidal rock pools at Punta Mujeres are the perfect place to cool off or rent some snorkelling gear and discover the island’s underwater wonders. Lanzarote’s busiest town is Puerto del Carmen and is a great place to enjoy the Canary Islands’ incredible sunsets. No matter which of these magnificent islands you choose, as the sun’s molten rays merge the ocean with the earth, you’ll realise this is a place where Mother Nature and history collide. The mythical city of Atlantis may be a story, lost in the mists of time but the Canary Islands are only a plane ride away. Whether you are searching for dramatic adventures or a sun-soaked vacation, this archipelago is alive with a powerful magic all its own.